Today I will take you to the Golden Pavilion in Kyoto, Japan. It was gorgeous setting and the Emperor's palace was beautiful. However, all the serenity was disturbed by the HUGE crowds-I think the absolute worse of anyplace we visited. Luckily I had a zoom lense on my camera so I could get some decent photos, that and the fact that you had to keep to a path and could not go near the Pavillion. One of these days I will figure out how to draw a bird that I really like. Birds are just one of those animals I can't draw quite right. :) But practice makes perfect, or so they say. And we're still dealing with spring bugs-these tiny flies are so bad on some days (if there's no breeze) you can't even step outside. Luckily there are only really bad for a couple of weeks and we are on the down side of them now. Have a fantastic Friday. And thanks for visiting. Now I have scrolled through all your beautiful posts I have missed in the meantime! They are all gorgeous! So many wonderful photos from your Japan trip, they are a fine memory! Funny your spring bugs page - but I can imagine not funny to meet these little bad ones outside! Luckily not the whole summer! You would NEVER have known there was anyone else at the Palace had you not told us. It DID look serene and beautiful. Your new lens came in handy there. WOW, I'm glad we don't have black flies. That would be scary. I've developed an ant problem though, so I'm not sure which is worse. I adore how you depicted them, though. You don't give yourself enough credit, dear Erika. Your birds (BOTH of them) are fabulous. The second one is out of this world and looks so textured, too. I am in awe of your drawing skills. You draw so much better than you believe you do. Thanks for sharing both these pages with us at Art Journal Journey this morning. The Golden Pavilion is beautiful. I especially loved the photo of the iris by the water. 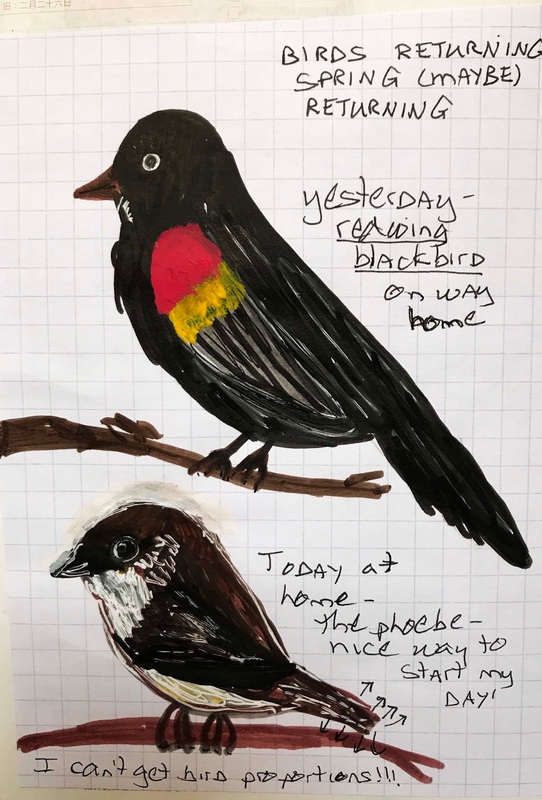 You did a great job drawing your birds. I haven't seen a redwing blackbird and I'm sure we have phoebes but I probably can't tell them apart form some other bird like a sparrow. Oh, and the may flies haven't been too bad this year. Usually, we can't go outside for the entire month of May without being swarmed. Oh wow--- two fantastic pages - I like your birds! 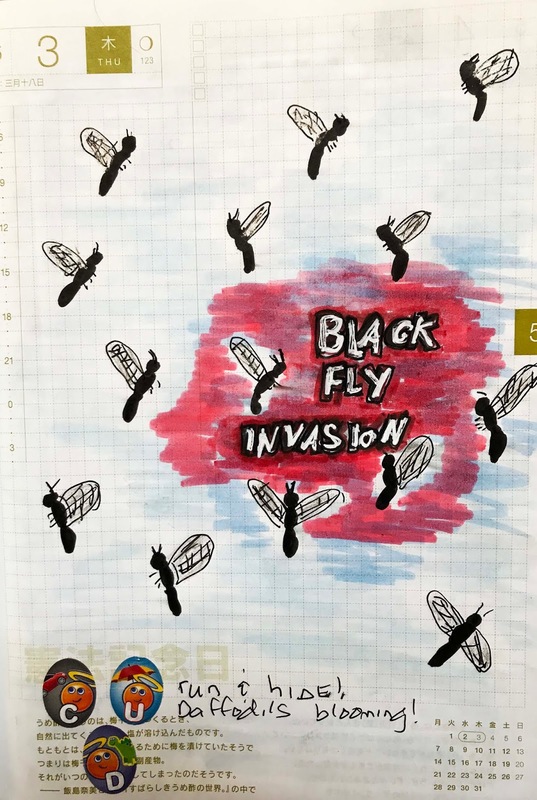 And I like this "Black fly invasion" page. Fantastic pages for the Flora & Fauna theme! Thank you so much for all your inspirational pages this month Erika! And I am thrilled about the Golden Pavilion and the beautfiul photos you got from the place with your lense - I can imagine that those places are crowded with tourists- not so nice and that this disturbs the peaceful feeling you would get from these places. Sun is here again - so hopefully a wonderful weekend again! Hope you have the same nice weather! The golden pavillion is wonderful Erika!! The photographs are excellent, thank you very mucho for sharing them with us. Beautiful photos, you shared, super views of this a wonderful place. I know how you feel about folk getting into the view of the shot you want to take. I delete many photos for this reason, thank goodness for digital cameras and we don't have to pay to get film developed. Your journal page with the birds is fabulous and I hope you loose those black flies soon. Your photos look amazing. Such a nice location but it would be better without so much people around it. To much people are a photographer's horror. Your birds looks very nice, not as bad as you think. A fly invasion is not funny. Hope it ends soon. Wonderful photos, and I love your birds and bugs Erika. Although I hope the pesky bugs leave soon! Your sketches are delightful too! Sorry about the fly invasion.. I can't draw birds either. You're much better than I.
Amazing you got photos without people, given the crowds. And lovely ones, too. Those irises are pretty terrific too and I love the garden sculpture. Very zen. What a gorgeous building. You perfectly caught the peace and serenity of the Golden Pavilion, even in the midst of the crowds. I don't see those birds around here. It's interesting how much the bird populations vary from region to region.